In this tutorial I am going to show you how printing a Fibonacci series using C Language for a given input using scanf. First we have to learn about Fibonacci Series of a given number. According to Wikipedia “In mathematics, the Fibonacci numbers are the numbers in the following integer sequence, called the Fibonacci sequence, and characterized by the fact that every number after the first two is the sum of the two preceding ones”. 0, 1, 1, 2, 3, 5, 8, 13, 21, …. 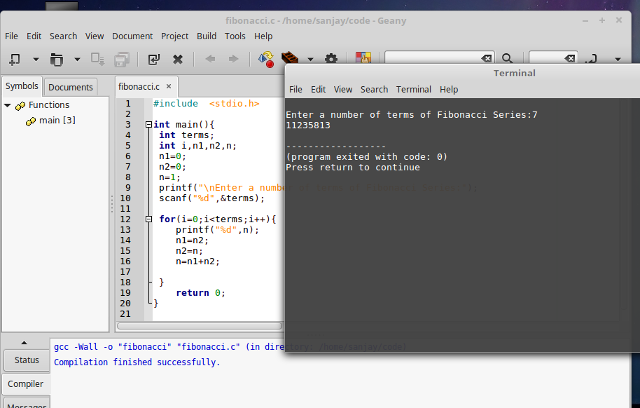 Create a file fibonacci.c with following code then compile and run .